I have exactly one cookbook that has one recipe in it using jackfruit. The book recommends finding canned jackfruit in an Asian specialty grocery store, and, after reading that, I thought, “Well, there’s a zero chance I’ll be making and trying that recipe.” You know how it goes, you read a recipe, and it’s either an “Ooooo, that’s gonna be gooooood!” moment, or a, “Um, yeah, I’m gonna pass on that one…” moment. If you google this fruit, you’ll find some typical facts: It is native to Southeast Asia; on its own, its flavor is a mixture of apple, pineapple, mango, and banana; it is fibrous, and nutritionally speaking is full of fiber, rich in vitamin C, B6, potassium, calcium, iron, and its seeds are rich in protein. It’s a powerhouse! It’s traditionally eaten as itself, a fruit, in sweet applications, or the seeds will be cooked down and added to curries. 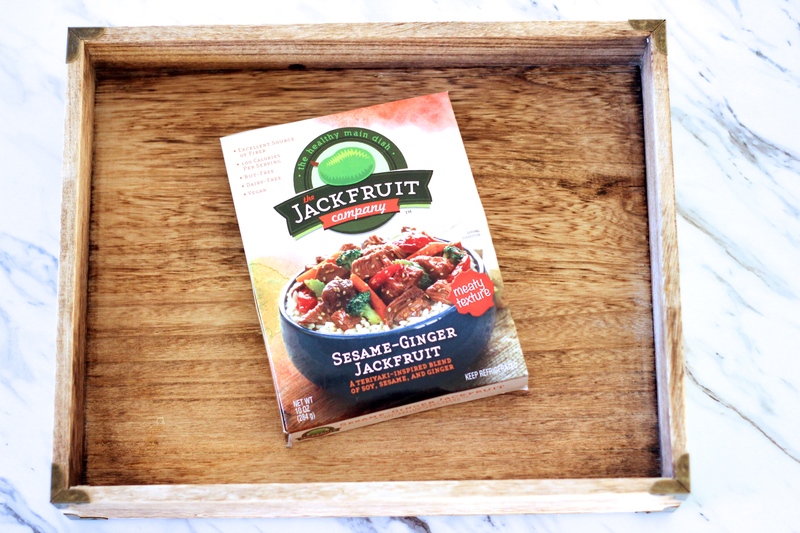 If you google The Jackfruit Company, you will discover an amazing company that has revolutionized the jackfruit, making it so accessible for your next quick weeknight dinner. Forget the canned stuff and Asian specialty grocery stores! 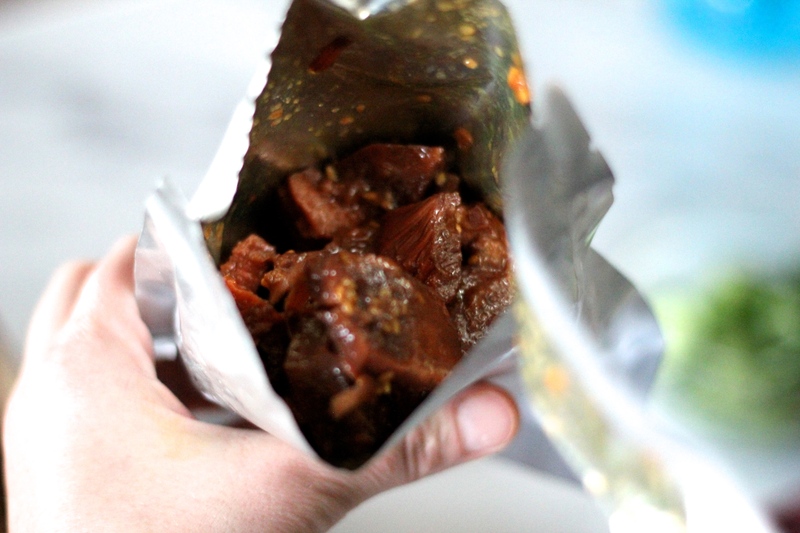 Because of The Jackfruit Company, you can find this fruit in four different flavors and in ready-to-eat packages. 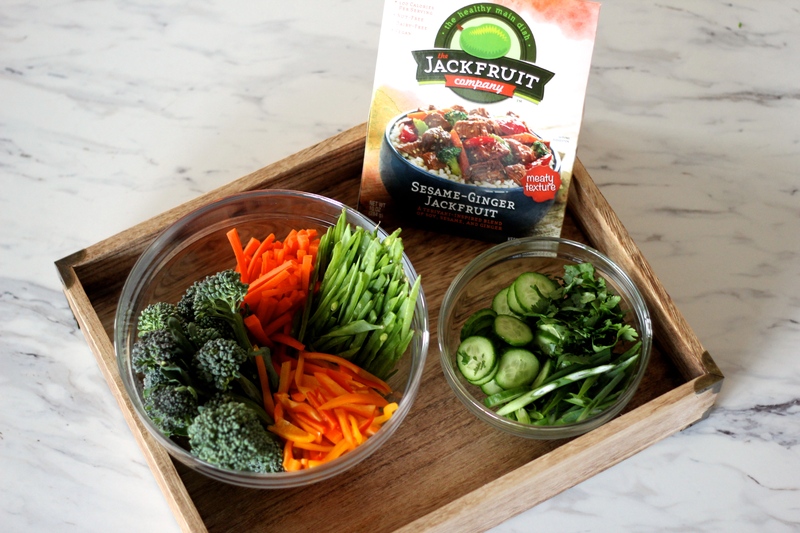 If you’ve had a busy day, you can still have Jackfruit BBQ sliders, Jackfruit TexMex tacos, Jackfruit Curry with rice, or a Sesame-Ginger Jackfruit Salad ready within minutes. I decided to go with the Sesame-Ginger Jackfruit, and paired it with rice noodles and veggies for a delish stir fry. I wasn’t sure how strong the already-sesame-ginger-flavored jackfruit would taste, and I didn’t want to overpower it with other flavors and seasonings, so I treated the veggies very minimally, just sautéed with olive oil, salt and pepper. Feel free to make a stir fry with whatever veggies you have on hand; I sautéed broccoli, orange pepper, carrot, snow peas, and stirred the jackfruit, chopped cilantro and sliced green onion into the cooked, warm rice noodles. 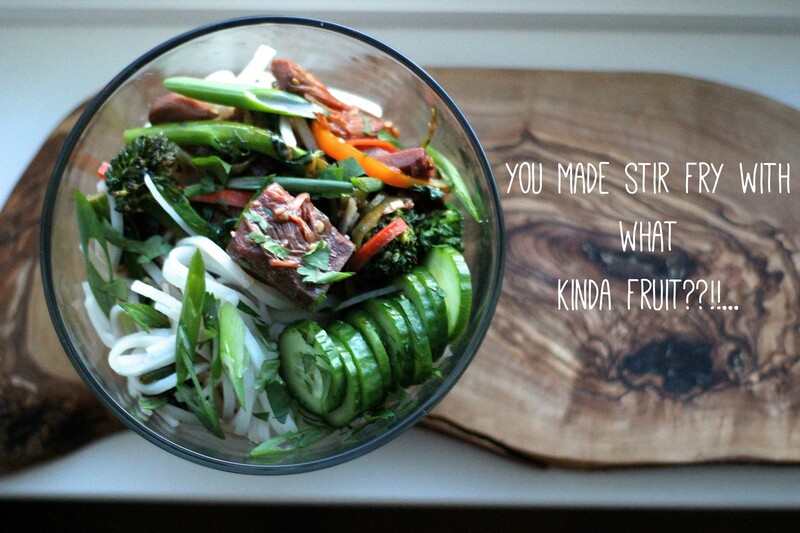 Garnish with sliced cucumbers, and you have a happy bowl, happy belly. I am definitely going back for more jackfruit! 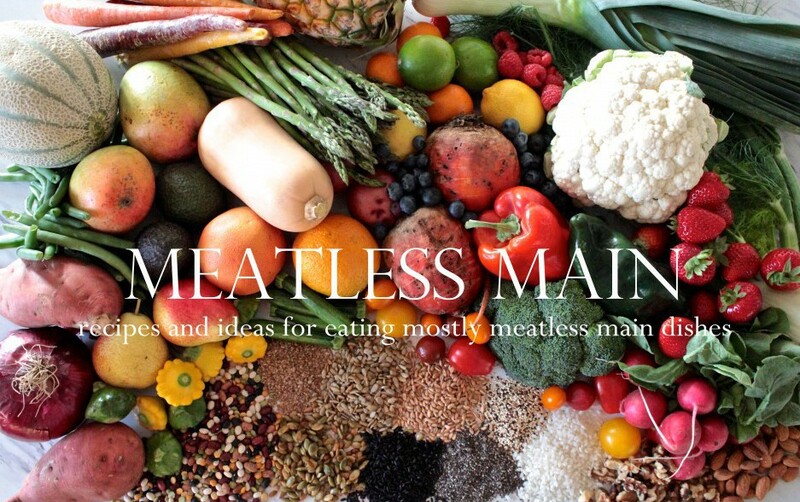 I loved my experience–it was sweet, flavored and seasoned just right, and it worked perfectly with the veggies–it wasn’t too heavy, like meat can be, it wasn’t stringy, and didn’t get caught in my teeth. This was the most melt-in-your-mouth stir fry I’ve had! Thanks, Jackfruit Company!